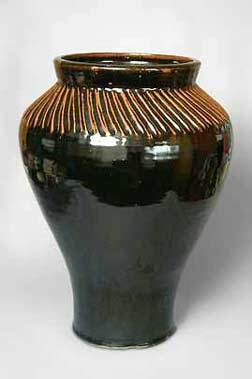 Monumental Aylesford Pottery vase - 18" (457 mm) high. Aylesford is said to be the oldest village in England. The name 'Aylesford' comes from 'Angles' Ford' - the place where the Angles crossed the river Medway. The brothers Hengist and Horsa, leaders of the first Anglo-Saxon invasion, landed in Aylesford in 449 A.D., where they set themselves up as the first Kings of Kent. Horsa was killed in 455, so he wasn't such a cute Angle. His obtuse brother, Hengist, lived another thirty-three years. After a peaceful four hundred years, Alfred the Great beat the Danes (the score is not recorded) and some four hundred years later the Carmelite order founded the Aylesford Friary in 1240 or 1283, (depending on which book you read). In 1954, mendicancy not being what it was, David Leach set up the Aylesford Priory Pottery for the White Friars. He stayed for a year, teaching pottery to the monks, and then handed over managership to Colin Pearson. The pottery is still in production, making the stoneware goods that have made it famous for over half a century.